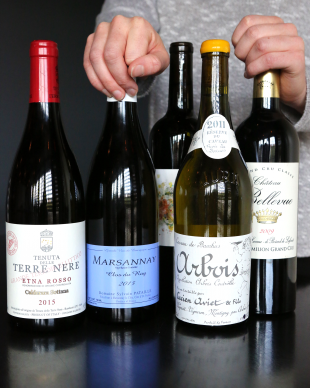 While the overarching philosophy behind our entire wine list is to provide complex, distinctive, terroir-driven wines that compliment our food, the rare and interesting bottles on the reserve list can be especially compelling. We’re often able to hunt down distinctive, uncommon wines – bottles that might represent a truly exciting discovery for some of our oenologically inclined guests. That part of our menu has seen some delicious additions in the past few weeks, and we thought we’d share a few notes. Owned and operated by the DiGrazia brothers who have an eponymous importer that we value a great deal, Terre Nere produces wines of Burgundian elegance from the slopes of Mt. Etna. This particular bottling comes from vines of 50 to 100 years of age growing among a moonscape of fist-sized lumps of pomace. It hits many of the indicators we look for when considering new wines – organic farming, working by hand, great terroir, thoughtful use of oak, et cetera. The result is a rich mix of cherry and plum with easygoing tannin and layers of mineral nuance. We’ve featured Pataille’s wines in the past, but the Clos du Roy – a vineyard slated to be elevated to premier cru status in 2020 – is a special treat. While Marsannay is often known for less serious pinot noir, the Clos du Roy is a very pure, complex expression with an array of fruit qualities ranging from currants to cherries to pomegranate. Highly aromatic and as fun as it is worthy of lengthy contemplation. Pataille himself is widely regarded as one of the best producers in Marsannay, and while this may spoil you, it’s nonetheless a great introduction to his wines. Pataille works biodynamically with organic certifications, ferments with natural yeast, and uses mostly neutral oak to age his wines. We love them and imagine you will as well. Try it with the current iteration of our grilled pork chop. Or if Andy decides to run his beef sugo special with porcini rigatoni, put a bottle of this alongside and spend 45 minutes in nirvana. California cabernet doesn’t often make an appearance on our list. Not because we don’t enjoy it but because it’s often too big, too ripe, or too oaked to match with our fare. And sometimes they’re just so damn expensive. But roaming winemaker Jason Edward Charles is making some delicious, affordable wines, sourcing fruit from the entire coast of California from Mendocino south to the Santa Cruz mountains. It’s in the latter area where Bates Ranch grows exceptional organic Cabernet that Charles harvests himself. It’s not an overly rich wine, showing pretty dark cherry qualities alongside some savory herbal, spicy, and mineral notes. And at the decidedly un-Californian price of 76 bucks, we’re fans. In the Jura region of France, there’s a red-stemmed mutation of Chardonnay that goes by the name Melon-Queue-Rouge. This particular bottling features grapes from 60-year-old vines that are fermented with natural yeast in large barrels. Each year, winemaker Lucien Aviet decides based on taste how long the wine will continue age on the lees. In 2011, he let the wine go a lengthy 49 months before bottling and released it well after a few subsequent vintages. As is the case with many chardonnay or Melon-Queue-Rouge wines from the Jura, there’s an apple tone to the wine along with cut grass, mineral notes, and fennel. A compelling – and rare – bottle. Bellevue deservedly acquired a bad reputation in the 90s. But after being essentially taken over by their neighbors, the famous Chateau Angelus, the wines returned to their historically heralded status. But perhaps because of their spotty history, the wines are quite affordable – especially when you consider that Angelus, one of the most famous and sought after wines of St-Emillion, has prized the Bellevue terroir for generations as documented in letters going back decades. 2009 is one of the last vintages in which there is still Cab Franc blended into the wine, and it’s our understanding that the Cab Franc is now blended into Angelus instead. At any rate, with great acidity and genuine complexity, this is a pretty classic St-Emillion drinking at its peak. Seriously good wine.